IIB Blogs – Not everything is Study! Hi everyone! Hope you are enjoying our experiences here..
We have just one week left in New Paltz, so we decided to seize the time! 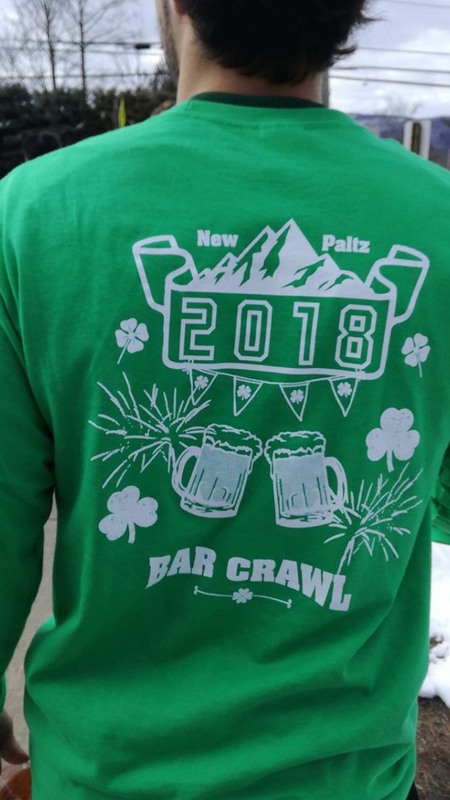 Last Saturday we celebrated the Bar Crawl Day 2018 Edition. For those who don’t know what’s about, is Saint Patrick’s Day ♣ ! Actually, this festival is next week, but as most of students are not gonna be on campus due to SPRING BREAK, they’ve decided to move it one week before. The streets were full of people who arrived at the afternoon to stay there until late night. Everyone was wearing green clothes and accessories related to Irish the culture. The entrance to the bars was totally free, and they offer some special editions of bottles and beverages, but as well as in Irish Pubs, beer was the the most common drink. After a long day of fest, we all meet on Pizza Gourmet (24 Hs open) to recharge energy and share our great experiences. It was a very special weekend and we had so much fun! This week we are saying Goodbye to New Paltz.. Next stop → New York City!